If you are looking for the modern RuneScape guide for this content, please see our Goblin Diplomacy guide. There's a disturbance in the Goblin Village. Help the goblins solve their dispute so the world doesn't have to worry about rioting goblins. Aim: to help the goblins decide which colour they will wear. 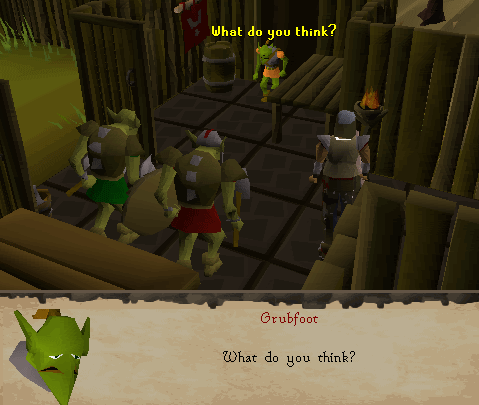 Talk to one of the Goblin Generals in Goblin Village, found north of Falador. 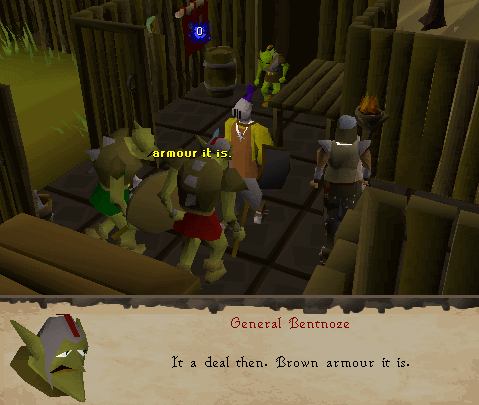 Firstly, visit the Goblin Village just north of Falador and speak to either General Wartface or General Bentnoze to hear them arguing back and forth about different armor colors. Ask them if they would like you to choose a color for them, and they both seem to agree on trying some Orange Goblin Mail. Since Goblins will only drop regular Goblin Mail, you're going to need to color the armor somehow. Aggie, the witch in Draynor Village should be able to help you by making some colorful dyes. You need to have 3 different dyes made, and each one requires a different ingredient, along with 5gp. You'll need a Red Dye consisting of 3 sets of Red Berries, a Yellow Dye made from 2 Onions, and a Blue Dye made from 2 Woad Leaves . Red Berries are found east of the Varrock Stone Circle. You can pick Onions from the garden just north of Rimmington, and Woad Leaves can be bought from Wyson the Gardener in Falador for just 20gp for a set of 2. Once you've gotten the 3 dyes, go back to the Goblin Village and start killing Goblins to get a Goblin Mail . Mix the Red and Yellow Dyes together to make an Orange Dye, and then use it with the mail to make an Orange Goblin Mail. Use this on either of the Generals and a cut-scene follows where Grubfoot will walk into a changing room and put it on. Neither of the Generals like it and they decide to try a blue mail. Use your Blue Dye with another Goblin Mail to get a Blue Goblin Mail. Again, use this with either General and a cut-scene with Grubfoot changing from Orange Mail to Blue Mail follows. Still the Generals aren't satisfied and want to try a Brown Goblin Mail. 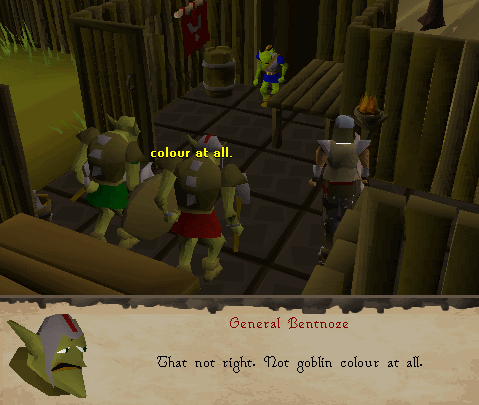 Don't be alarmed because you haven't got the dye for it: instead, you can search a crate in the house in the west part of Goblin Village for a Brown Goblin Mail. Use this with one of the Generals and once again a cut-scene of Grubfoot changing gear. After this, both Generals agree that brown is the best color.